"EditMe doesn’t require technical expertise, and so we’re able to have many people in our organization contribute to it. We’ve been pleasantly surprised and happy with our experience." Easy content editing for a non-technical audience. Multiple access levels for non-members, members and authors. EditMe's content management tools are easily used by a non-technical audience. EditMe's powerful access control options provide easy access rights management. 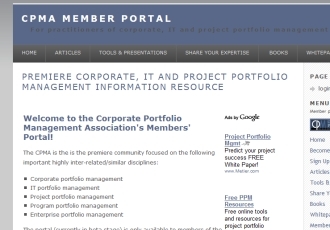 The Corporate Portfolio Management Association (CPMA) is the premiere community for practitioners of corporate, IT and project portfolio management. The group has nearly 170 members spanning a diverse array of industries, geographies and sizes. The CPMA was founded to provide a venue in which portfolio management practitioners can share ideas, best practices and tools, and a collaborative web solution was the perfect vehicle to host this exchange. "In essence, we needed a site where members can go to share information and ask each other questions. It needed to be easy to navigate, aesthetically appealing and enable collaboration amongst the members," explains Jennifer Beyer of CPMA Member Services. The CPMA stumbled upon EditMe in a Google search and decided to give it a try. "We began playing around with it creating a small test site. It worked quite well and met all of our requirements. Additionally, the simplicity of the pricing model was enticing and the ease of use let us create something quite quickly." The CPMA Member Portal also provides content resources to members, including articles, white papers, case studies and presentations. CPMA Member Portal introductory content is open for public access, while the deeper member resources require a membership login to view. Members can also contribute presentations and articles via a member's only content submission page, allowing CPMA staff to review content before publishing it on the site. CPMA employees are given Author status and can edit all of the site content. The CPMA wanted to use their own domain name for the site, which was done with a simple email to EditMe support. Additionally, EditMe helped CPMA set up Google Analytics for detailed tracking of site activity using the same tools they use to track their other sites.